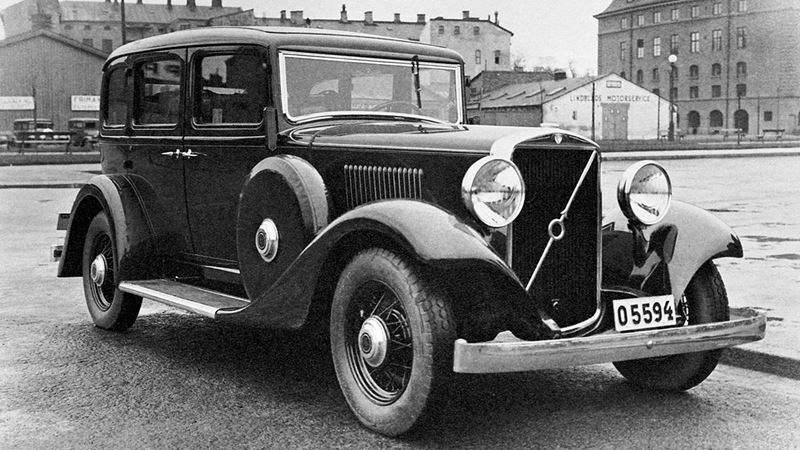 The first six-cylinder Volvo car appeared as early as 1929 and developed versions of this car were to follow. In 1933, the PV653 (standard) and the PV654 (de luxe) were introduced. These were comfortable, quiet and rugged cars for everyday use with reliable engines in traditional style. The 654 de luxe version had a very plush interior, twin spare wheels and a reversing light, and it was available in several colours. The PV655 was the chassis version, suitable for special bodies. The launch in 1935 of the PV658 and PV659 changed the appearance of the car considerably. The radiator sloped slightly backwards and a grille was fitted in front of the radiator. The special wheel hubcaps also contributed to the new character. A more powerful version of the 6-cylinder engine was another new feature. It had a displacement of 3.67 litres and developed 80-84 bhp. 653-5: In-line, 6-cyl, side valves; 3,266 cc(198 cu in) 79.4 x 110 mm; 65 bhp at 3,200 rpm. 224 cu in 84.14 x 110 mm, 84 bhp at 3,300 rpm. 3-speed with free wheel, floor lever. Wheelbase 116 in; weight 3,925 lbs. Two hundred and thirty PV653s and 361 PV654s were built between 1933 and 1934.